Update: The video that was originally embedded in this post was missing some of its subtitles. Vlad has kindly corrected the problem and uploaded a new version. If you are using the video that was displayed here earlier, you may want to switch your embed to this one, since it is more complete. Thilo Sarrazin is a member of the board of the Bundesbank in Germany, although possibly not for much longer. The German elites have taken against him, and he may soon be excommunicated from the establishment. 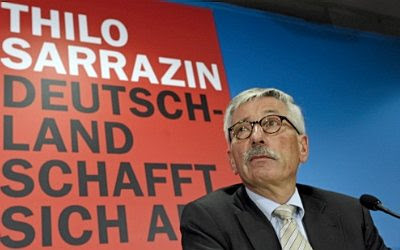 As I mentioned on Tuesday, Mr. Sarrazin’s outspoken opinions about immigrants have caused controversy for several years, but the real trouble began with the recent publication of his new book, “Deutschland schafft sich ab — Wie wir unser Land aufs Spiel setzen” (“Abolishing Germany — How we’re putting our country in jeopardy”). The video below from German television takes a look at the furor caused by Thilo Sarrazin. It allows the author to make his points clearly in his own words. However, like the Australian TV program about Geert Wilders, the progressive media people who produced this documentary are at pains to prove that Mr. Sarrazin is a dangerous bigot and racist. As you will see, he causes a major outbreak of the Screaming Nazi Heeber-Jeebers among the refined and enlightened guardians of German culture. Polite German society has closed ranks against him. There are problems and aberrations in the area of integration and immigration in our city, and it is true that the real problems must not be whitewashed by politics. Anyone, like Sarrazin, however, who, say, bases problems in, say, education on hereditary factors and disadvantages among immigrants, well, he is beyond help… It needs to be condemned clearly here and now. What would “whitewashing” consist of, if not preemptive condemnation of a hypothesis without the process of research, examination, and logical deduction necessary to prove it wrong? Did Mr. Henkel do his homework on population genetics and the statistical correlation of social behaviors with genetic factors? Did he immerse himself in twin studies, or longitudinal statistical investigations of families over several generations? Investigation into this topic has been closed. Simply to discuss it is to be just like a Nazi. Anyone who talks about it should be shunned, and maybe even imprisoned. A “whitewash” would be a big improvement. A complete transcript of the video is below the jump. Is Germany abrogating itself? The Thilo Sarrazin controversy. A film by Boris Hermel and Iris Max. Here it is — the threat to Germany. Immigrant children. Allegedly, they learn nothing, can do nothing, and merely cost the state money. Actually, we do not need the Muslim immigration to Europe. cost the state treasury more than they bring in. and moral values they represent signify a step backward. for the cultural and civil balance in an aging Europe. pithy comments on integration policy. Recently, an interview in the magazine, “Lettre International” caused outrage. There were protests, calls for his ouster from the (SPD) party. in black and white, in 464 pages, what he thinks of Muslim immigration. with immigrants from East Europe, from other EU states. But these problems were largely undone after one generation. marry German partners as early as the second generation. mostly partners who immigrate from Turkey especially for this purpose. in the German school system. must not be whitewashed by politics. on hereditary factors and disadvantages among immigrants, well, he is beyond help. That is ultimately a statement of profound contempt for humanity. It needs to be condemned clearly here and now. tough demands in the matter of integration, Sarrazin’s in-breeding thesis goes too far. and that they have genetic disadvantages which make it superfluous to put in an effort. That is very dangerous. That is close to race theory. He speaks of “Muslims.” I consider that not only dangerous, but false. We know we have Sunnis, Shias, Alevites. The life styles of these faiths are quite different. the prohibition of violence and the human striving to learn. I can understand that these people feel disparaged by Thilo Sarrazin. in line with the question: Are they useful or harmful to Germany? produce goods and services that are in demand word-wide. That is what our living standard comes from. And this base is threatened. to replenish the growing deficits we have. And this too correlates systematically with the Islamic cultural circle. Sweden, that the Immigrants from Muslim countries have special difficulties in adapting. they live for the most part — although not all of them — closed off and isolated. They show no interest in the culture of the majority. They perform below average in the job market. and again and again, they are the cause of unrest in their host populations. Muslim immigrants are a nucleus of violence and criminality. Sarrazin sees a danger for coming generations. and then, pardon the bluntness, nothing will disturb me any more. but also much richer per capita than we are. It is not the first time a culture has collapsed under an onslaught from outside. to demand Sarrazin’s departure from the party. On the other hand, he is applauded from a completely different side. and want to accept him into their ranks. which he is using, generalizing and by doing that himself becomes racist and nationalistic. He brings up problems and does not solve them. so that we could solve the integration problems. that the NPD today says that it is a perfect NPD position. An analysis that is shared inside the SPD, for instance by Raed Saleh. the Spandau SPD head, who has Arab roots. that Dr. Thilo Sarrazin’s theses are clearly to be designated as racist. 90% of people of Arab derivation cannot or will not integrate. He says that people are stupider or more intelligent according to their heredity. but not on individual persons; rather, on whole groups of persons. basically, no longer ethically defensible. a vanguard warrior and preserver of the German way of life. in the way that German administration works, and we find that we like living here. And we like living among Germans. someone passes through the city in a turban. Even if it were only turbans, however, there would still be a problem. and I also have a problem with lots if head scarves. He writes it in his book just as he says it in the interview. and the rhythm of daily life set by the call of the muezzin. If I want to experience that, I can book a trip to the East. A polemic statement that is not well received in Neukölln. so let us just stay with his example of the Turks. from Turkey that has volunteered to come to Germany. from areas with little education, people who had never attended a school. of the Turkish association that 80% of Turkish guest workers’. come from the lower social classes of Turkey. you encounter a very different Turkish population. who have been living in very difficult social circumstances. So, false analysis, says Buschkovsky. Why is he taking up this debate? There are things that can occupy you for decades. The subject of demography has captivated me since the beginning of the decline in the birth rate in 1970. I was 25 years old at the time and followed it with fascination. just swept problems under the rug. After all, it was decades in the future. and now the problems are here and only now do people start to talk about it. but he finds Sarrazin’s book not only unhelpful, but counter-productive. and that it will then come to a catastrophe. And with that, he denies society any ability to learn. He also denies it the ability to adjust to these problems. So. And this is where I give up. Frank Henkel (head of the Berlin CDU): That [Sarrazin's position] is ultimately a statement of profound contempt for humanity. Gah! What is it with the way that these Liberals remain totally immune to all sense of irony? Far more worrisome than any Political Incorrectness on the part of Sarrazin should be a monumental concern about how Islam's doctrine "is ultimately a statement of profound contempt for humanity". Of what use is it to stew and bother over dissenting views while there is another much larger and violent force that seeks simply to eradicate your kind entirely? Henkel is swallowing the Islamic camel whole whilst strangling upon Politically Incorrect gnats. Hajo Funke (Politologe FU Berlin): I would say it is connected to our having problems with integration which he is using, generalizing and by doing that himself becomes racist and nationalistic. This is rather curious. Funke seems to equate nationalism with racism. How then is a person to have any sense of patriotism without descending into bigotry? Or is that even possible, for White people, at least? Hajo Funke: I think this reference to the people becoming stupider, and fewer, and even dying out — that is the idea of the death of a people — that we know from National Socialism, and it is no coincidence that the NPD today says that it is a perfect NPD position. This appears to be, at the least unintentional misdirection, if not an outright lie. Sarrazin's main point appears to deal with how German people and culture may be in danger of "dying out" and not the anti-Nazi hysteria that Funke is trying to drum up. Someone please tell me if I have misinterpreted this. Raed Saleh: There was a report by Dr. Botsch [This may refer to Nicole Bosch] last year which attempted to define various characteristics of racism. With all the characteristics it came out that Dr. Thilo Sarrazin’s theses are clearly to be designated as racist. Thus, it is highly dubious as to whether the pedigree of Raed Saleh's cry of racism on the part of Sarrazin has any merit. Simply put, much of this video seems to be a hatchet job on Sarrazin. bah, its so stupid. Every criticism of the multicultural project is "racism", all racism is Nazism, all Nazism is out of bounds.